Next in the hierarchy is legislation made by the National Assembly for the whole of the territory of Nigeria, Nigeria being a federation, and within the Exclusive Legislative List, which sets out the legislative competence of the federal legislature. The customary laws of the various indigenous tribes within Nigeria are also recognised as part of the legal system, provided that they are not repugnant to natural justice, public policy or contrary to any written law. Last in the hierarchy is common law, law created and refined by judges and inherited from Nigeria’s past as a British colony. At the state level, there are two tiers of courts. The lower tier consists of magistrates’ and customary courts. Appeals from these courts go to the superior courts of record established for each state – the High Court, which is the upper tier. The lower courts are, for the present purposes, unimportant. Appeals from High Court (federal or state) decisions lie with a federal court of appeal, and from there to the Federal Supreme Court, which is the final appellate court. In addition, there are also special courts and tribunals such as the National Industrial Court, the Investment and Securities Tribunal5 and the Tax Appeal Tribunal.6 Appeals from the latter two lie with the High Court. The National Industrial Court began as an inferior court from which appeals went to the High Court. However, under a constitutional amendment that took effect on 4 March 2011, the National Industrial Court shall have and exercise jurisdiction to the exclusion of any other court in civil causes and matters relating to or connected with any labour, employment, trade unions, industrial relations and matters arising from the workplace, conditions of service, including health, safety, welfare of labour, employees, workers and matters incidental thereto or connected therewith. Appeal from the National Industrial Court before June 2017 lay with the Court of Appeal only on questions of fundamental rights as contained in Chapter IV of the Constitution of Nigeria. However, with a recent decision of the Supreme Court,7 all Appeals from the National Industrial Court can now be entertained by the Court of Appeal, and this jurisdiction is not limited only to fundamental rights matters. The jurisdiction of all the High Courts is set out in the Constitution, with the Federal High Court possessing exclusive jurisdiction in certain areas such as admiralty, aviation, taxation, revenue, trademarks, patent rights and corporate matters. State High Courts have unlimited jurisdiction over all other matters where the Federal High Court does not have exclusive jurisdiction. In Lagos State, the High Court is divided into five geographical judicial divisions, and into six subdivisions according to subject matter. There is no maximum number of judges in the High Court, and there are presently 56 judges in the Lagos State High Court. Appeals may be made from the High Courts, as a matter of right, of final decisions. Appeals may also be made of interlocutory decisions, as a matter of right, if the grounds of appeal are grounds of law alone. Appeals in other instances may be pursued with leave, obtained from the High Court or from the Court of Appeal. Further appeals from the Court of Appeal to the Supreme Court may be made where the grounds of appeal are grounds of law alone. In all other circumstances, appeals require the leave of the lower court. Where leave is denied, a further application for leave to appeal may be made to the appellate court. The framework governing ADR in Nigeria includes statute, case law, customary law and general principles of law. Nigeria has ratified and enacted into law the New York Convention8 and the ICSID Convention.9 Nigeria’s Arbitration and Conciliation Act (ACA)10 is modelled on the UNCITRAL Model Law on arbitration. Lagos State is the only state in the federation that has enacted its own arbitration statute.11 Nigeria is also a member of the World Trade Organization, which also provides for the settlement of disputes between states. Over the last year the focus of the courts have been on matters relating to corruption and financial crimes. Thus there are no recent decisions that the authors consider to be material for inclusion here, as most of these cases have either been struck out or are still ongoing. Many states12 in the federation have reviewed the civil procedure rules applicable in their High Courts along the lines of the review carried out by Lagos State13 in the High Court of Lagos State (Civil Procedure) Rules 2004. As indicated above, Lagos State has published new civil procedure rules for the High Court of Lagos State, which took effect on 1 January 2013. 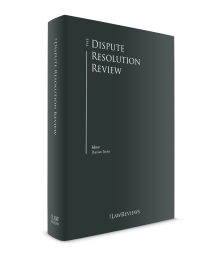 Specifically, the most recently introduced rules all aim to discourage frivolous litigation and expedite dispute resolution by means of several novel provisions. The new Lagos Rules are used as a reference below. h unsuccessful parties may appeal to the Court of Appeal within three months of a final judgment and 14 days of an interlocutory decision. Parties may file motions at any time during the course of litigation, although the pretrial procedure is designed to ensure that motions are disposed of in advance of a case proceeding to trial. The Lagos State Chief Judge has, pursuant to the Lagos Rules, issued practice directions for a fast-track procedure. Cases assigned to the fast-track route are to be concluded within eight months from their commencement, and for a case to qualify for the fast-track procedure it must be for a claim (or counterclaim) of a minimum of 100 million naira; involve at least one party who is a non-resident investor in Nigeria; or involve a mortgage transaction.14 All the procedures provided for in the fast-track programme stipulate time frames shorter than those provided for in regular proceedings. For example, the pretrial conference period is limited to just 30 days, when for the regular procedure it lasts three months,15 and final judgment is to be delivered within 60 days of closing addresses, whereas for regular procedures it is 90 days. Although the application of these new rules has resulted in speedier resolution of applicable rules, the targets set by the rules are not being met by the courts. All court rules provide for the bringing of urgent applications, which may be brought without notice (ex parte) against the adversary in appropriate circumstances, and the seeking of interim preservative orders to last until the determination of a subsequent similar application notified to the adversary.16 Where a party apprehends an occurrence that may irreparably damage his or her interests, the rules require him or her to bring his or her application (setting out his or her interests and the dangers apprehended in an accompanying affidavit) without delay to ensure an expedited hearing. The most notable innovation of the new court rules is the requirement for a party to attach to his or her originating processes all documentary evidence and statements of witnesses to establish a claim or defence.19 This enables the adversary to have a fair picture of the claim and the evidence by which it would be proved. It also enables the court to assess the strength or otherwise of the claim. The court could then direct that the parties explore the possibilities of arbitration by referring them to the arbitration or mediation arm of the court, where the compromise effort could be professionally directed. In addition, filing charges for new cases are assessed at a percentage of the sum being claimed, and this new practice has made it more expensive for plaintiffs to file actions. The aim is to deter all but the most serious litigants. In addition, another objective of the new rules is to expedite the delivery of justice. In Nigeria, it is possible for a limited number of claimants to institute and prosecute actions for themselves and for persons with similar interests. However, individual claimants must establish their own loss or damage. As a result, class actions of the type frequently seen in the United States, for example, are extremely rare in Nigeria. Citizens’ rights to represent themselves in proceedings before a court are contained in the Constitution as part of the right to fair hearing.23 This provision permits all natural persons to prosecute their cases or defend cases against them without counsel if they so choose. Where a person cannot afford litigation (for civil and criminal proceedings), legal aid is made available in Nigeria. The Legal Aid Act provides for a Civil Litigation Service to assist indigent persons to defend and enforce any right or privilege to which that person is ordinarily entitled under the Nigerian legal system. It also provides for a Criminal Defence Service to assist indigent persons involved in criminal investigation or proceedings with advice, assistance and representation.24 Lagos State has also established an Office of Public Defender, and the statute makes provision for legal aid to be provided in civil cases. 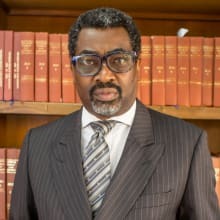 The question as to the possibility of a non-natural person appearing in court to handle proceedings was settled by the Supreme Court in Mode (Nig) Ltd v. UBA Plc.25 In that case, the appellant company’s director sought to argue the appeal on behalf of the company as the company was unable to afford counsel. The Court ruled that a litigant may appear in person, but a company is not in the same position as a natural person and thus could not be represented by its director or officer and only by counsel, as the rules of court do not contemplate that a company can sue or appear in person. The various rules of courts in Nigeria contain similar provisions for service of process on parties outside their primary jurisdictions.26 The State High Court’s jurisdiction is limited to the physical territory of that state, but the Federal High Court has nationwide jurisdiction, so outside jurisdiction for it is outside Nigeria.27 However, the rules ordinarily provide that service on natural persons shall be personal; that is, the delivery of process physically on the defendant,28 and for non-natural persons by delivering same on specified categories of principal officers at designated addresses of such entities.29 However, regarding service out of the jurisdiction, the rules make no distinction between the mode of service on natural and non-natural defendants, but it is widely accepted that the modes of service stipulated in Rules 6 and 8 would apply, and in the event of failure of such service the court could order substituted service upon application by the plaintiff. For originating processes, the rules require service by court bailiffs or other accredited process servers.34 Parties are expected to be served personally except where this has proved impossible, whereupon the plaintiff could apply for substituted service as discussed above. However, where a party has instructed counsel that has entered appearance to the action, processes meant for service out of the jurisdiction could be properly served on counsel. The rules apply to natural and legal persons. Generally, Section 36(3) of the Constitution of the Federal Republic of Nigeria, the rules of court and other enactments expressly make it mandatory for proceedings of court to be held in public.42 Members of the public have unfettered access to attend and observe any ongoing court proceedings. This right of access does not, however, give members of the public an automatic right to obtain information in relation to court proceedings. A citizen desiring information regarding specific proceedings must comply with the prescribed application process. A court or such a tribunal may exclude from its proceedings person other than the parties thereto or their legal practitioners in the interest of defence, public safety, public order, public morality, the welfare of persons who have not attained the age of eighteen years, the protection of the private lives of the parties or to such extent as it may consider necessary by reason of special circumstances in which publicity would be contrary to the interest of justice. If, in any proceedings before a court or such a tribunal, a minister of the federal government or a commissioner of the government of a state satisfies the court or tribunal that it would not be in the public interest for any matter heard in private to be disclosed, it shall take such other action as may be necessary or expedient to prevent the disclosure of the matter. In cases where the proceedings are not restricted, an application for certified true copies of evidence is approved by a judge in chambers and, more often than not, the applicant making the request may be required to state his or her interest in the matter before request for pleadings or evidence is granted. After the grant of the approval, a statutory fee, usually assessed by the registrar, is paid before the eventual collection of same. In addition, the passage of the Freedom of Information Act, No. 4, 2011, has made public records and information more freely available to the public. Under this Act, a person has the right to access or request information, whether or not in any written form, that is in the custody or possession of any public official, agency or institution howsoever described. An applicant need not demonstrate any specific interest in the information being applied for. The position is slightly similar to the one stated above. An application is usually made to the chief registrar of the court stating the request and if possible the reasons for it. Where the applicant is a party in the proceedings, the approval for information is usually given as a matter of course except if there are cogent reasons for its refusal. After the approval in both cases, statutory fees, usually assessed by the registrar, are paid before a certified true copy of the information is obtained. Nigeria, as a former British colony, operates a common law system, under which maintenance, ‘the procurement, by direct or indirect financial assistance, of another person to institute, or carry on or defend civil proceedings without lawful justification’ and champerty, an aggravated form of maintenance, in which the maintainer received ‘a share of the proceeds of the action or suit or other contentious proceedings’ were prohibited. In the general context, however, it was not certain whether Nigerian courts would continue to recognise these ancient prohibitions. However, within the Nigerian legal profession, both champerty and maintenance were expressly prohibited under the rules of professional conduct, until 2007, when new rules were introduced. The removal of this prohibition went unnoticed for several years. The increased interest in litigation funding in other jurisdictions, has resulted in renewed scrutiny of this area in Nigeria. While there do not appear to have been any instances where litigation funding has been considered by Nigerian courts, it seems to be clear that there are no restrictions in Nigeria as to third-party funding of litigation. Lawyers’ fees can be categorised into two areas. The first is the fees to be earned as an advocate, and the second the fees to be earned as a solicitor. The fees earned as a litigator are unregulated. These fees are essentially determined by negotiation between the client and the litigator. With regard to work done for basic non-contentious or advisory work, the fee is also a matter for agreement between the solicitor and the client, but in assessing the fee, the solicitor would ordinarily be expected to take into account such factors as the subject matter of the dispute, the amount of time spent and the experience or age of the counsel involved. The Legal Practitioners (Remuneration for Legal Documentation and other Land Matters) Order 1991 regulates the remuneration of legal practitioners in the preparation of legal documentations and other land matters.44 These fees are fixed and non-negotiable.45 However, instances where the scale is not applied are frequent, and these pass with little, if any, attempt to prevent the practice. Regarding fees charged for probate matters, lawyers have developed the practice of charging a fixed percentage of the total amount of the estate, usually 10 per cent. The emerging trend in line with the practice in other jurisdictions in this area relates to the usage of a predetermined hourly rate as the basis of the calculation of fees. Information barriers that are common in jurisdictions where large firms are the norm and the separation is more easily enforced are less likely to be needed in Nigeria, where the firms, if partnerships, are small and are mostly single-proprietor firms. This is an area in which Nigeria awaits future developments, as law firms grow in size and sophistication. The Rules of Professional Conduct (2007) regulate the ethical conducts of lawyers in Nigeria. They make provision for the duties of lawyers towards judges, co-lawyers and their clients. A lawyer also has the obligation to reveal any illegal or fraudulent act of his or her client, except when the information is a privileged communication. The protections conferred by privilege attach to the individuals and class of persons named in the statutory provisions conferring the privileges. Principally it protects a witness from giving evidence relevant to an issue before the court. Persons not protected by privilege cannot avail themselves of it. An individual from whom privileged information is ordered by a regulatory agency may only seek judicial intervention to prevent being made to hand over the required information. Foreign lawyers would be bound from violating privilege if they are to be witnesses in proceedings conducted in accordance with Nigerian law under which the protections conferred by the Evidence Act would be given effect. The only documentary evidence admissible in Nigerian courts is evidence relevant to prove facts in issue. Relevance is the foundation of admissibility in this jurisdiction,56 and if the court finds a document to be irrelevant to the determination of the issues in dispute then such a document would be rejected and so marked. Subject to the proper foundation being laid regarding the production of documents stored electronically overseas, copies would be receivable in evidence in proceedings in Nigeria if they are private documents. Copies of public documents similarly stored overseas would also be admissible if shown to have been issued from proper custody. Only copies of said documents need be produced in court to be received in evidence. The rule of evidence in Nigeria has not been reformed to permit documentary evidence in Nigeria by electronic means. Regardless of who has custody of the originals of a document, copies would be received in evidence if the party intending to rely on them shows them to be relevant and lays proper foundation for their admissibility. There is no requirement to produce all documents held by subsidiary or parent companies, but if they are relevant and proper foundation is laid, they would be admissible. The production of documents held by third-party advisers is subject to the provisions regarding privilege in the Evidence Act. To enjoy privilege, third-party advisers must be legal practitioners as the Act only protects attorney–client communication acquired or produced in the course of the relationship or employment. This privilege does not cover the client. Electronically stored documents cannot be received in evidence in that state unless hard copies are made and the necessary foundation laid for their admissibility. A litigant may review electronic records for the purpose of litigation mainly under the rules of discovery where the facilities and the documents are under the control of the adversary or third party, where a document that may aid the litigant is in the electronic storage of the adversary and the adversary consents to the litigant’s access to such records. This scenario is optimistic, as practice shows that adversaries do not normally hand their opponents the information voluntarily. Rather, the natural reaction of the adversary would be to suppress records and seek to disclaim or discredit copies of said records produced by the litigant. The rules of privilege also apply to in-house lawyers because they are bound by both the Evidence Act, various rules of court and case law. An in-house lawyer like any other lawyer cannot be compelled to give evidence or produce confidential information or exhibits of what transpired between himself or herself and a client. The rules regarding privilege may apply to a foreign lawyer in the same manner it would apply to an in-house lawyer in Nigeria. Except where this does not comply with the privilege law in his or her country of origin, a foreign lawyer cannot be compelled to give evidence or documents containing confidential information shared with a client. There has been no recent development in this area in Nigeria as the law still appears to be static in this regard. Arbitration in Nigeria is primarily governed by the Arbitration and Conciliation Decree,59 which is a federal statute. However, in 2009, the Lagos State House of Assembly enacted an Arbitration Law, in force in Lagos State, providing a different statutory framework for the conduct of arbitration in Lagos State. The constitutional basis upon which the Lagos State House of Assembly enacted the legislation is that the subject of the legislation – commercial contracts – is a residual matter,60 not being contained in the legislative lists in the second schedule to the Constitution. The major local arbitral institutions are the Lagos Court of Arbitration, the Nigerian Branch of the Chartered Institute of Arbitrators and the Lagos Regional Centre for International Commercial Arbitration. The Lagos Court of Arbitration was created by the Lagos State legislature in 2009 to promote arbitration and ADR within Lagos State, and to make rules for arbitration conducted under the Lagos State Arbitration Law. The main international institutions involved in Nigeria-related disputes include the Permanent Court of Arbitration, the International Centre for Settlement of Investment Disputes, the Court of Arbitration of the International Chamber of Commerce, the London Court of International Arbitration, and the WIPO Arbitration and Mediation Centre. Arbitration is increasingly accepted by both the legal and business communities in Nigeria as an alternative to litigation. Furthermore, it has become common for investors to always insist on inserting arbitration clauses into commercial agreements; this is to avoid resorting to litigation in the event of a dispute and is considered expedient as it is flexible and faster; parties can choose their venue and the applicable laws and appoint their arbitrators, and privacy and confidentiality is also guaranteed. The options viable for the enforcement of foreign awards are laid down in Section 51 of the Arbitration and Conciliation Act. The application for the enforcement of a foreign award is made ex parte supported by an affidavit with, inter alia, a duly authenticated original award or duly certified copy thereof, an original arbitration agreement or duly certified copy thereof and, where the award is not made in English, a duly certified translation. In this jurisdiction, mediation is generally governed by the agreement of the parties to a contract. The rules governing mediation may be established by the parties involved in a dispute or by incorporating rules of some mediation and conciliation organisation, such as the Optional Conciliation Rules of the International Chamber of Commerce or the Conciliation Rules of the American Arbitration Association. The statutory provisions governing mediation include the Arbitration and Conciliation Act, the Lagos State Multi-Door Courthouse Laws of Lagos State, 2007. Other forms of ADR are provided for by the Multi-Door Court House. The Multi-Door Court House is an ADR centre annexed to the court that offers a variety of ADR processes. It was established to supplement available resources for easy access to justice. The options available at the Multi-Door Court House include, but are not limited to, the following: early neutral evaluation, conciliation and negotiation. The year 2017 was challenging for Nigeria and the country’s legal profession. Anti-corruption litigation still dominates the landscape as the Buhari-led regime have concentrated more on the crippling corruption that has placed the nation in a deprived political and economic situation, and was widely alleged to have been perpetrated by previous political and military leaders. The legal profession also has its own share of anti-corruption litigation, as the crusade ensured that judges, including Supreme Court justices, were arrested in late 2016 for allegations of bribery and corruption. A number of those judges have been arraigned before the court, and one of them have been dismissed of all charges preferred against him. The trial of other judges arrested is still ongoing. In pursuance of the anti graft war waged by the Buhari-led administration, anti-graft agencies have been able to recover huge sums of money and property that have been alleged to be fraudulently converted from Nigerian National Petroleum Commission (NNPC) by Diezani Allison-Madueke (former Minister of Petroleum), for the federal government, mostly through the whistle-blowing policy introduced in December 2016. The Nigerian government has also signed various bilateral agreements on extradition and Transfer of Sentenced Persons and Mutual Legal Assistance on Criminal Matters, which include the recovery and repatriation of stolen wealth. A prominent case that has been decided in 2017 is the case that settles the issue of whether an appeal in labour disputes can be made from the National Industrial Court to the Court of Appeal on any issue, without considering whether or not they bother on Human Rights. Over the years, it had been the belief that appeals from the National Industrial Court to the Court of Appeal should only rest on questions of Fundamental Human Rights. However, the decision of the Supreme Court in Skye Bank v. Victor Anaemem Iwu66 has finally put to rest the controversy on conflicting Court of Appeal decisions67, on the right to appeal against a judgment of the NIC. By this decision, an appeal against the decision of the NIC is not limited to only fundamental rights. The practical implications of this decision would be that most employers with the financial resources will now initiate appeals against the decisions of the NIC thereby frustrating aggrieved employees who may not be able to afford the high cost of prosecuting appeals to the Court of Appeal. Nonetheless, widespread support for the anti-corruption drive will likely ensure that 2018 is set to be a busy year for reforms in terms of the judiciary. 1 Babajide Oladipo Ogundipe and Lateef Omoyemi Akangbe are partners at Sofunde, Osakwe, Ogundipe & Belgore. 2 Section 1, Constitution of the Federal Republic of Nigeria 1999. See also the Court of Appeal decisions in Attorney General, Oyo State v. Nigerian Labour Congress 2003 8 NWLR Part 821 1 and Orhiunu v. Federal Government of Nigeria 2005 1 NWLR Part 906 3. 3 Inspector General of Police v. All Nigeria People’s Party (2007) 18 NWLR Part 1066 457 at 496C-E.
4 See Orhiunu v. Federal Government of Nigeria, supra. 5 Established pursuant to Section 274 of the Investment & Securities Act No. 29 of 2007. 6 Established pursuant to Section 59 of the Inland Revenue Act, 2004. 8 In the second schedule of the Arbitration and Conciliation Act. 9 Decree No. 49 of 1969 Constitution. 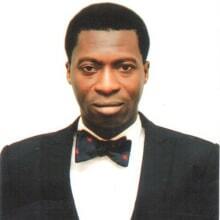 11 Lagos State Arbitration Law No. 18, Chapter A342, 2009. 12 The Federation of Nigeria is made up of 36 states and a Federal Capital Territory. 13 The Lagos State High Court Rules are preferable as their application is directed towards the achievement of a just, efficient and speedy dispensation of justice. 14 See Paragraph 2 of the Practice Directions on Fast Track Procedure. 15 See Paragraph 7 of the Practice Directions on Fast Track Procedure. 16 See Order 38, Rule 1 of the High Court of Lagos (Civil Procedure) Rules 2004 and Order 9, Rule 8 of the Federal High Court Civil Procedure) Rules, 2000. 17 See Order 39, Rule 3 of the High Court of Lagos State (Civil Procedure) Rules, 2012. 18 See Order 39, Rule 4 of the High Court of Lagos State (Civil Procedure) Rules 2012. 19 See Order 3, Rule 2(1) of the High Court of Lagos (Civil Procedure) Rules 2012. 20 See Order 39, Rule 1 of the High Court of Lagos (Civil Procedure) Rules 2012. 21 See Order 44, Rule 4 of the High Court of Lagos (Civil Procedure) Rules 2012. 22 See Order 49, Rule 1 of the High Court of Lagos (Civil Procedure) Rules 2012. 23 See Section 36(2)(a) of the 1999 Constitution. 24 See Section 8, Legal Aid Act, 2011. The second schedule to the Legal Aid Act also lists the proceedings in respect of which legal aid may be given. 25 2004 15 NWLR (Part) 897 p. 542. 26 See Order 8 of the Federal High Court (Civil Procedure) Rules 2000. 27 See Order 6, Rule 5 of the Federal High Court Rules. 28 See Order 13, Rule 2 of the Federal High Court Rules. 29 See Order 13, Rules 6 and 8 of the Federal High Court Rules. 31 The said provision of the Lagos State Civil Procedure 2012, particularly Order 8 Rule 1, is in reference to land or any property that can be inherited; that is, anything that passes through intestacy. In other words, a judge may allow any originating process or other process to be served outside Nigeria where the property to be inherited is within its jurisdiction. 32 See Order 8, Rule 1 (a–l). 33 See Order 8, Rule 2 of the High Court of Lagos State (Civil Procedure) Rules 2012. 34 See Order 13, Rule 13 of the Federal High Court Rules. 35 See the introductory and descriptive part of the 1958 Ordinance. 36 See Witt & Busch Ltd v. Dale Power Systems Plc 2007 17 NWLR Part 1062 1. 37 Section 3(1) Part I of the 1990 Act. See Witt & Busch Ltd v. Dale Power Systems Plc, supra. 38 See the Supreme Court decision in Macauley v. RZB Austria (2003) 18 NWLR Part 852 282 and the Court of Appeal decision in Teleglobe America Inc v. 21st Century Tech Ltd (2008) 17 NWLR Part 1115 108. 39 See Order 13, Rule 23 of the Federal High Court (Civil Procedure) Rules 2000. 42 See Section 36 of the Constitution of the Federal Republic of Nigeria. 43 Constitution of the Federal Republic of Nigeria, 1999. 44 Legal practitioners (Remuneration for Legal Documentation and other Land matters) Order 1991 published in No. 40 Vol. 78 Gazette of Federal Republic of Nigeria. 45 Order 7, Section 1 of the Legal Practitioners (Remuneration for Legal Documentation and other Land matters) Order, supra. 46 See Oyo v. Mercantile Bank (Nig) Ltd, supra, Paragraphs B–C. 47 See Smith v. Mansi, 1962 3 All ER 857. 48 See Rule 15(2)(b) of the Rules of Professional Conduct (2007). 49 (Chapter C23, Laws of the Federation of Nigeria 2004 (as amended). 50 Section 14 of the FOI Act provides that a public institution is obliged to deny an application for information that contains personal information unless the individual involved consents to the disclosure, or where such information is publicly available. Also, Section 16 of the FOI Act provides that a public institution may deny an application for disclosure of information that is subject to various forms of professional privilege conferred by law (such as lawyer-client privilege, health workers-client privilege, journalism confidentiality privilege). 51 This Act regulates the protection of children (persons under the age of 18 years) and limits access to information relating to children in certain circumstances. 52 Section 26 of the NIMC Act provides that no person or corporate body shall have access to data or information contained in the Database with respect to a registered individual entry without the authorisation of the Commission. The Commission can however provide another person with information recorded in the individual’s entry in the Database without the individual’s consent for example, interest of National Security, for purposes connected with the prevention or detection of crime or for any other purpose specified by the Commission in a regulation. 53 See Words and Phrases Legally Defined, Volume 3, third edition, p. 46, Butterworths; and Black’s Law Dictionary, eighth edition, p. 1234, Thomson West. 54 For example, see Sections 161(3), 166, 168, 170, 174 and 176 of the Act. 55 Abubakar v. Chuks  18 NWLR. 56 See Sections 6 and 10 of the Evidence Act and also Agunbiade v. Sasegbon 1968 5 NSCC p. 147 at 150. 57 Ogunonzee v. the State 1997 8 NWLR Part 516 566 at 588. 58 Jacob v. AkwaIbom State 2002 7 NWLR Part 765 p. 18 at 39. 59 Arbitration and Conciliation Act. 60 Under the Nigerian Constitution, legislative powers are shared between the federal and state legislatures. While the federal legislature is empowered to make laws in respect of matters contained in the exclusive and concurrent legislative lists, state legislators are empowered to make laws in respect of matters not contained in the exclusive legislative list. Such matters include those on the concurrent legislative list (to the extent that the federal legislatures have not made any law in respect thereto). All other matters are considered to be ‘residual’ matters, and are matters in respect of which only the states may legislate. 61 See Sections 30 and 32 of the Arbitration Act. 62 See Schedule II of the Arbitration and Conciliation Act. 63 Federal Inland Revenue Service v. NNPC & 2 Ors (2012) 6 TLRN 1 and Federal Inland Revenue Service 4 Ors (2012) 6 TLRN 87. 64 Comments by Emmanuel Gaillard at the ICCA Conference in Singapore in June 2012. 65 See the Lagos Multi-Door Court House, The ADR Centre Practice Direction pursuant to Section 274 of the Constitution of the Federal Republic of Nigeria 1999. 67 Local Government Service Commission, Ekiti State v. Mr. M. A. Jegede (2013) LPELR- 21131, and Coca Cola (Nig) Limited & 2 Ors v. Akinsanya  18 NWLR (Pt.1386), 225.